Travel to Santorini. Fligths. Boats. Ferry timetable. Santorini is one of the most accessible islands amongst the Greek islands, choose between charter flights, international flights, domestic flights or ferries. 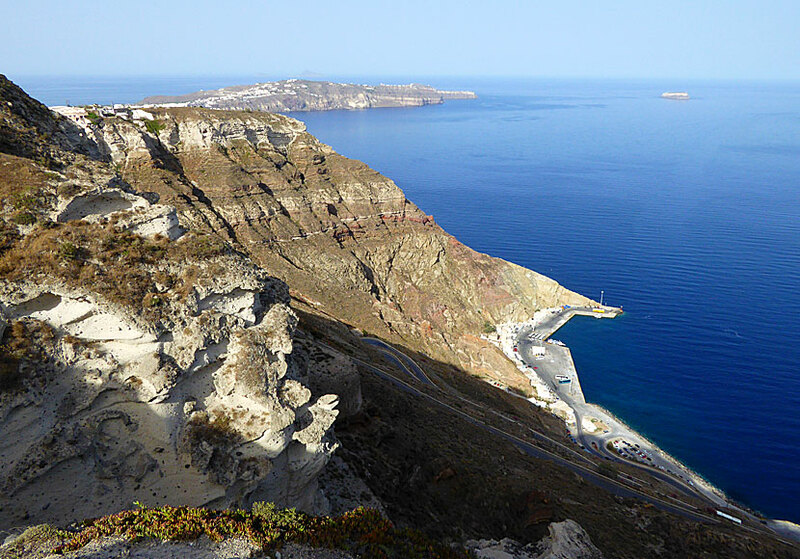 The island is perfect to use as a base when you are island hopping: the boat connections to other islands is extraordinary, it is easy to get to and from the island, and of course Santorini is also well worth seeing. Santorini is a popular island for package tourism and it is possible to go here from many countries, check with a travel agency in your country. Common charter destinations are Fira, Firostefani, Imerovigli, Kamari, Perissa, Perivolos and Vlychada. 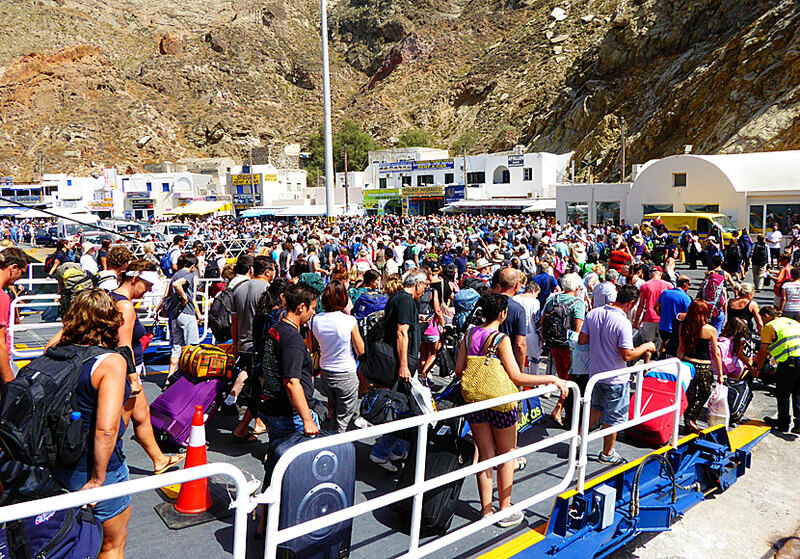 Be prepared for long queues at the airport of Santorini when you are going home, because there is really no room to swing a cat at the check-in counters. At the airport there is a coffee shop with scandalous prices and a tiny "duty free shop" where you can buy sweets, perfumes, souvenirs and alcohol. The small airport in Santorini. Seats on charter flights to Santorini can be sold individually through a charter company. Another option is to buy a flight-only seat to Athens and continue by ferry or domestic flight. Or you can go by air to Rhodes, Mykonos and Crete. 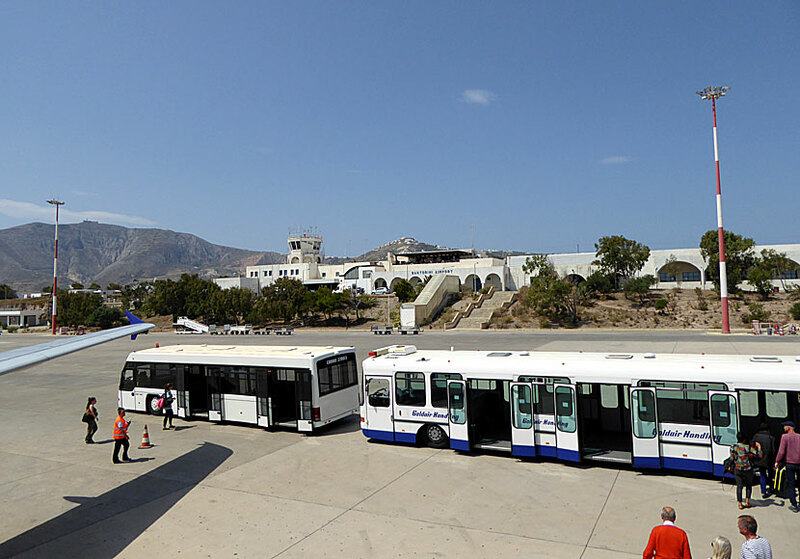 Rhodes and Crete have both air connections and boat connections with Santorini, while Mykonos only has boat connections. Santorini has daily plane connections with Athens and Crete, as well as a few flights a week to Rhodes and Thessaloniki. Santorini's port is called Athinios and is located in the caldera almost in the middle of the island. 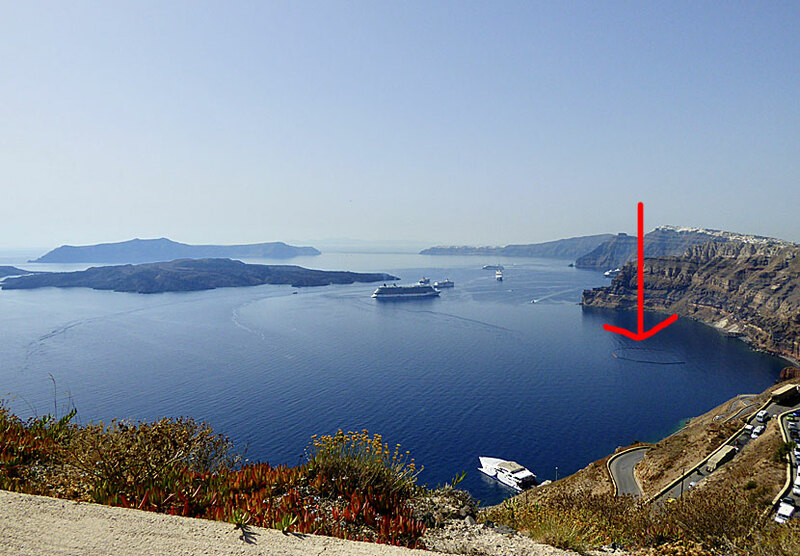 Before the port of Athinios was built, the ferries docked in the small port below Fira. The port of Santorini is visible at the bottom right. Athinios is one of Greece's few uninhabited ports, it is a port, period. But do not think that there are no people there, the boat traffic is enormous in high season and there are coming and going ferries all the time. Travellers gather at the expensive tavernas waiting for the next ferry, usually it is more or less chaotic. Especially when you arrive to Santorini by ferry, hordes of letters of rooms are waiting a hundred metres from the ferry and they are in desperate search of customers. One want nothing more than to get away as fast as possible. The port of Santorini is one of the most chaotic in all of Greece. There are several travel agencies in the port where you can buy boat tickets. Some of the cafes have left luggage service, so if you have to wait long for your ferry, you can leave the luggage there and take the bus to Fira, or to a beach. Buses to Fira awaits most of the ferries, bus transfer to other parts of the island can be made along the way, or in Fira. The ride up from the port is a real adventure, the road winds like a serpentine road in the Alps and the precipice sometimes feels dangerously close. The road down to the port is to the right in the picture. Under the red arrow the cruise ship Sea Diamond sank on April 6, 2007. The boat is at 140 meters deep. Two of 1,600 on board died.